My intuitive art journal practice awakens my authentic self and allows me to access wisdom I already possess. I developed my intuitive art journal practice after years of working in written journals and traditional art journals. For many years, I faithfully recorded my thoughts in a notebook every morning. It was full of entries that explored the same issues and concerns, day after day after day. I became frustrated. I already know what weighed on my mind and made me feel like I was spinning my wheels in mud; I wanted guidance. Interestingly, I knew the answers were within me, I just couldn’t access them this way. I came to the conclusion that the process of writing sentences kept me in my left brain, the linear and analytical half. This hemisphere is very helpful for planning a budget and making decisions but not so helpful when I want to get in touch with the source of my own wisdom, my intuition. I turned to my art for answers. Art journaling gave my right brain freedom to fly into areas my left brain wouldn’t dare to go. The right hemisphere of the brain is in charge of creativity and artistic expression. It wants to play, explore, and be adventurous. I splashed colors on dry surfaces and watching as colors flowed into one another on wet surfaces. Then, I grabbed spray inks, stencils, stamps, water-soluble crayons, and bits of paper to layer and create different effects. It was fun and relaxing. I explored colors, compositions, and subject matter that made their way into artwork I exhibited and sold. Like a written journal, an art journal has a purpose and I value it when my intention is to experiment and discover. But there was still an aspect of myself that hungered for something more. I longed to integrate my artistic side and my logical side in a way that honored my uniqueness and opened me to deeper inner knowing. My intuitive art journal practice is one way I awaken my authentic self and access the wisdom I already possess. By weaving together ritual, meditation, guided visualization, and artistic expression with what I learned from spiritual guides, artists, and writers along the way, I am able to tap into information that has always been available to me. I just had to learn how to access it. Intuitive art journaling is a sacred process that allows me to hear the quiet voice within. The piece above, Accept and Love, is one example of the messages I receive when I’m open and willing to surrender to my higher Self. In other words, I allow the process to inform me. I become my own guide. Do you have a practice that allows you to awaken your authentic self and receive wisdom? 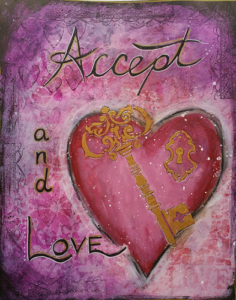 Are you interested in learning more about intuitive art journaling?